>> "CREATIVE LIVING," UTILIZING TODAY'S TECHNOLOGY WITH THE BEST OF THE PAST TO BRING YOU INNOVATIVE IDEAS AND UP-TO-DATE INFORMATION FOR CREATIVE LIFESTYLES IN TODAY'S ACTIVE WORLD WITH YOUR HOST--SHERYL BORDEN. >> THANKS FOR JOINING ME TODAY FOR "CREATIVE LIVING." WE'RE GOING TO LEARN HOW TO RESHAPE YOUR ROOM SIZE, MAKE A T-SHIRT SCARF, AND SEE HOW TO DO INSERTION LACE MACHINE EMBROIDERY. 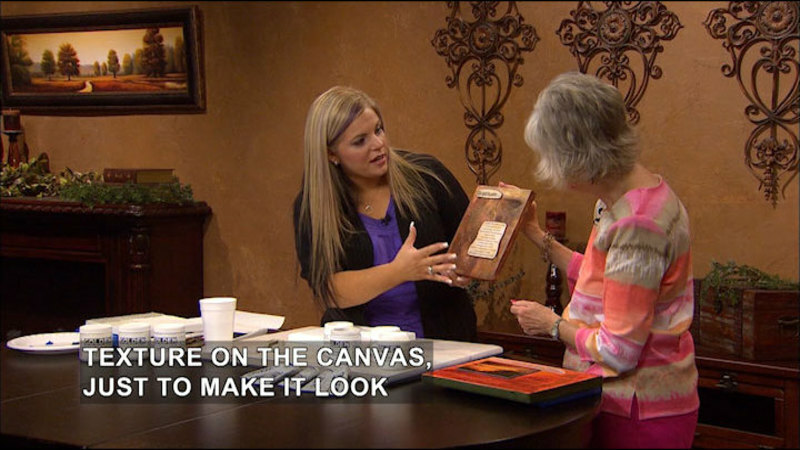 ONE OF MY GUESTS IS KIMBALL STARR, AND SHE'S AN INTERIOR DESIGNER FROM SAN FRANCISCO, CALIFORNIA. KIMBALL'S GOING TO EXPLAIN THE TOOLS YOU CAN USE TO CHANGE HOW YOU PERCEIVE THE SHAPE OF A ROOM'S INTERIOR AS WELL AS CHANGE LIGHTING, PATTERN AND COLOR. HER BUSINESS IS KIMBALL STARR INTERIOR DESIGN. ANOTHER GUEST IS MARISA PAWELKO, AND SHE'S A DESIGNER AND EVENTS COORDINATOR. SHE REPRESENTS WESTCOTT BRAND CUTTING TOOLS, IMAGINE CRAFTS, AND TSUKINEKO INKS, AND MARISA'S GOING TO DEMONSTRATE HOW TO CREATE A QUICK AND EASY T-SHIRT SCARF USING VARIOUS CUTTING TOOLS. THE SCARF CAN BE EMBELLISHED AND CUSTOMIZED IN SEVERAL DIFFERENT WAYS. SHE'S FROM WINFIELD, ILLINOIS, AND HER COMPANY IS MODERN SURREALIST. AND WE'LL BEGIN THE SHOW TODAY WITH LAURA WATERFIELD, AND SHE'S A DESIGNER AND DIGITIZER. LAURA'S GOING TO DEMONSTRATE INSERTION LACE MACHINE EMBROIDERY, AND AS YOU'LL SEE, THIS CREATES AN HEIRLOOM DESIGN THAT CAN BE DONE ON MOST FABRICS. THE SECRET TO THIS TECHNIQUE IS TO USE A WING NEEDLE. 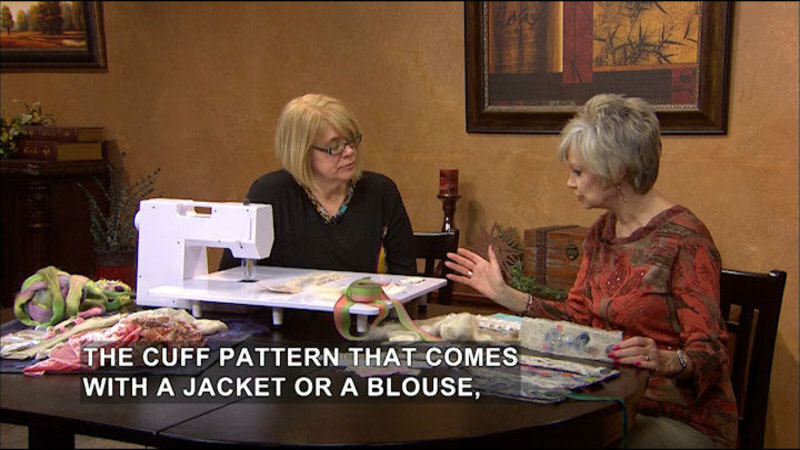 LAURA'S COMPANY IS LAURA'S SEWING STUDIO, AND SHE'S FROM TOMBALL, TEXAS. LAURA, THANK YOU SO MUCH FOR COMING. EVERY TIME YOU COME, YOU BRING A PROJECT THAT I'VE NEVER WORKED WITH BEFORE, AND I THOUGHT YOU JUST DID EMBROIDERY WORK, BUT WE'RE GOING TO TALK TODAY ABOUT INSERTION LACE. HOW DID YOU GET ONTO THAT? >> INSERTION LACE IS AN HEIRLOOM SEWING TECHNIQUE. 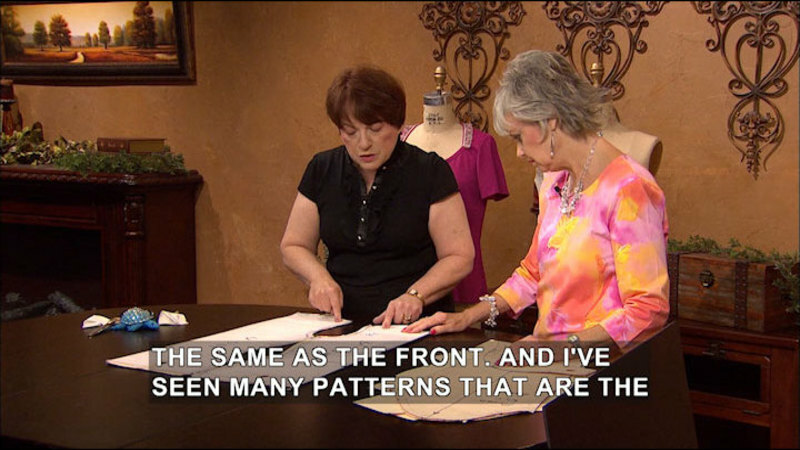 NOW, NORMALLY YOU SEW LACE ONTO A PIECE OF FABRIC, AND THEN YOU CUT THE FABRIC AWAY FROM BEHIND, AND THAT WAY YOU HAVE JUST NO FABRIC BEHIND, AND IT SHOWS. AND THIS-THIS WAY, WE'RE GONNA DO IT ON THE EMBROIDERY MACHINE, WHICH DOES ALL THE WORK FOR YOU. >> OH, UH-HUH. >> THIS IS ONE OF THE PROJECTS WE DID. THIS IS-- >> THIS IS BEAUTIFUL. >> YOU CAN SEE THROUGH THERE HOW IT'S CUT OUT. >> UH-HUH. >> AND THIS IS ACTUALLY A LINGERIE BAG, BUT IT'S A VERY GOOD SIZE FOR A TRAVEL PILLOW. >> I'LL TRY TO MOVE MY HAND. THAT WAY WE CAN SEE ALL THE WAY THROUGH. IT'S HARD TO SEE ON THE WHITE. THAT'S JUST EXQUISITE. >> THANKS. >> OKAY. >> AND THIS IS-- >> THIS IS A LITTLE EASIER TO SEE. >> ON A KNIT FABRIC. YOU CAN DO THIS ON A KNIT FABRIC AS WELL. THAT'S A WOVEN FABRIC, THIS IS A KNIT FABRIC. AND THIS IS ON A SHIRT THAT I DID. SO YOU HAVE TO BE CAREFUL-- >> IT LOOKS SO DAINTY, SO DELICATE. >> YOU HAVE TO BE CAREFUL WHERE YOU PUT THESE ON CLOTHES SINCE YOU CAN... >> SEE THROUGH THEM. YEAH. SO PLACEMENT IS VERY IMPORTANT. >> RIGHT. >> OKAY. >> IT'S ON CLOTHES. AND WHAT I DO IS I HOOP A LAYER OF WATER-SOLUBLE STABILIZER, AND THIS IS WATER-SOLUBLE STABILIZER. I ACTUALLY USE 2 LAYERS, AND I'LL SHOW YOU WHY IN A MINUTE. >> AND THIS IS A SPECIAL NEEDLE THAT WE NEED TO POINT OUT. >> A SPECIAL NEEDLE THAT WE USE, A WING NEEDLE, AND IT'S A 120 SIZE WING NEEDLE, AND THIS NEEDLE HAS LARGE SIDES THAT BOW OUT ON EITHER SIDE OF IT, SO WHEN IT PENETRATES THE FABRIC, IT CREATES A HOLE INTO THE FABRIC. >> SO IT'S PUNCHING IT IS WHAT IT'S DOING. >> RIGHT, UH-HUH. IT'S PUNCHING THE FABRIC, AND THE STITCHING, THE THREAD ACTUALLY HOLDS THE HOLES OPEN... >> OH, OKAY. >> ...IS HOW IT WORKS. SO, WHAT I DO IS I--HERE IT IS. I'VE DONE ONE HERE IN A CONTRASTING COLOR, AND I'VE GOT 2 LAYERS OF WATER-SOLUBLE AND ONE LAYER OF MY FABRIC. >> NOW, YOU WERE GOING TO TELL US WHY YOU USE 2 LAYERS. >> RIGHT. BECAUSE YOU HAVE TO CUT OUT THIS AREA THAT'S GONNA HAVE THE LACY SPOTS, AND INVARIABLY I ALWAYS TEND TO CUT SOME PIECE OF MY STABILIZER... >> OH, THAT'S SMART. >> YEAH, SO JUST IN CASE. AND I'VE CUT SOME OF THIS OUT ALREADY. >> YOU JUST LEARNED FROM EXPERIENCE THAT-- >> RIGHT. YOU JUST CUT THESE OUT. USE YOUR LITTLE CURVED SCISSORS, AND YOU CUT OUT THIS CENTER PIECE. >> AND YOU GET REAL CLOSE TO THE EDGE, DON'T YOU, BUT NOT CUT THROUGH THE STITCHING. >> DON'T CUT THE STITCHING, AND YOU DON'T WANT TO CUT YOUR STABILIZER. BUT LIKE I SAID, SOMETIMES A LITTLE PIECE WILL GET PUNCTURED, AND I LIKE TO HAVE A SECOND LAYER IN THERE IN CASE I CUT IT. AND YOU CAN SEE I DID CUT THAT A LITTLE BIT OVER THERE. SO, ANYWAY, WE'RE OKAY, BECAUSE WE HAVE A SECOND LAYER. >> THAT'S GOOD. >> RIGHT. AND THAT'S JUST THE WING NEEDLE AREA. AND AFTER YOU CUT OUT YOUR FABRIC LIKE THIS, THEN YOU WANT TO PUT YOUR HOOP BACK ONTO THE MACHINE AND FINISH SEWING THE DESIGN. AND IT'LL SEW THE FINISHING STITCHES AND LITTLE LACY AREAS THAT YOU SEE. I HAVE ONE-- HAVE ONE HERE THAT'S DONE. >> OKAY. >> YOU CAN SEE IT ON THE TABLE. >> OH. THAT'S WHAT YOU'RE DOING IS PUTTING THIS IN THE AREA THAT YOU CUT OUT. >> RIGHT. THE FIRST THING THAT SEWS IS YOUR WING NEEDLE AREA, AND THEN YOU STOP AND CUT THIS OUT, AND THEN YOU PUT IT BACK ON. I THINK THIS-THIS IS THE FRONT, ACTUALLY. >> OH, THAT'S PRETTY. >> AND IT SEWS ALL THESE LITTLE LACY AREAS IN HERE AND FINISHES OFF THE LITTLE SATIN-STITCH EDGE OF THE FABRIC SO THE FABRIC WON'T RAVEL. >> DO YOU EVER DO CONTRASTING COLORS? >> UH-HUH, I HAVE SOME. HAVE ONE I'VE DONE--JUST SOME SAMPLES I'VE DONE IN PURPLE. >> OOPS. >> AND YOU CAN MAKE THEM ANY COLOR YOU WANT. >> OH, YEAH. THOSE ARE BEAUTIFUL. ANY SIZE, I GUESS. OH, I LIKE THE WAY YOU DID THE CENTER ON THAT ONE. >> MM-HMM. LITTLE EXTRA IN THERE. THERE'S A LITTLE HEART. >> UH-HUH. >> ALSO HAVE SOME-- >> IT LOOKS LIKE HAND WORK. >> YEAH, IT DOES. >> MY GRANDMOTHER USED TO DO CROCHET, AND THAT'S WHAT IT LOOKS LIKE TO ME. >> DOES A LITTLE BIT. NOW, HERE'S SOME CORNERS. WHEN YOU'RE DOING--WHEN YOU'RE MAKING, LIKE, TABLE LINENS, YOU WANT TO MAKE CORNERS, AND THEN IF IT'S A LONG TABLE LINEN, YOU MIGHT HAVE THESE ON THE CORNERS AND THESE ALONG THE SIDES. KIND OF MAKE IT LOOK LIKE IT GOES ALL THE WAY AROUND THE EDGE. THEN YOU'VE GOT SOME OF THESE OTHER DESIGNS IN THE CENTER OF THE TABLECLOTH. >> OH, YOU COULD JUST DO AS MUCH AS YOU WANTED. I IMAGINE IT'S SORT OF ADDICTIVE, ISN'T IT, ONCE YOU GET STARTED? >> OH, VERY. >> BECAUSE IT'S SO PRETTY. >> MACHINE EMBROIDERY IS ANYWAY. >> OH. [LAUGHS] >> ALSO YOU CAN ALSO WEAVE RIBBON INSIDE OF THESE AREAS. AND I'LL PUT MY RIBBON INTO A TAPESTRY NEEDLE, AND YOU JUST WEAVE IT IN AND OUT THESE LITTLE LACY AREAS, AND IT'S REAL EASY TO DO. >> THAT'S EASY AND FAST. >> RIGHT. >> HOW DO YOU FINISH IT OFF AT THE END? >> WELL, AT THE BACK, I JUST CUT THIS OFF, AND YOU WOULD HAND-STITCH THIS CLOSED. >> OKAY. PUT A LITTLE FRAY CHECK OR SOMETHING ON IT? >> FRAY CHECK WOULD BE A GOOD IDEA, UH-HUH. >> OKAY. >> HERE'S ANOTHER ONE. I DID PUT RIBBON IN THIS ONE, BUT I TIED LITTLE KNOTS AT EACH ONE OF THE CORNERS, IS I DID THOSE, JUST TO ADD A LITTLE MORE TEXTURE. AND THIS IS ALSO ON KNIT FABRIC AND THESE ARE WOVEN FABRICS. YOU COULD SEW IT ON EITHER FABRIC. NOW, WHEN YOU'RE SEWING ON KNIT FABRIC, YOU CANNOT USE A WING NEEDLE. BECAUSE WING NEEDLES AND SHARP NEEDLES MAKE HOLES IN KNIT FABRIC, YOU HAVE TO USE A BALLPOINT NEEDLE IN YOUR KNIT FABRICS. >> WHEN YOU'RE DOING KNIT. BUT IF YOU'RE DOING THE OTHER FABRICS--THE LINENS OR ANYTHING ELSE--YOU USE THE WING NEEDLE. >> RIGHT. AND YOU COULD SEE IT'S JUST AS PRETTY WITHOUT THE WING NEEDLE AS IT IS WITH THE WING NEEDLE. >> I THOUGHT YOU USED THAT WITH ALL OF THEM. >> AND THIS TOP IS THE SAME WAY. IT HAS A--I DIDN'T USE THE WING NEEDLE ON THIS AROUND THE EDGES, BUT YOU CAN SEE THAT STITCHING AROUND THE OUTSIDE EDGE. IT'S JUST AS PRETTY. >> WELL, THESE ARE JUST BEAUTIFUL. WOW. I BET PEOPLE LOVE FOR YOU TO GIVE THINGS LIKE THESE AS GIFTS TO THEM, DON'T THEY? HA HA. >> YES. >> WELL, THANK YOU VERY MUCH FOR SHOWING US HOW EASY IT IS TO DO. >> THANKS FOR HAVING ME. >> MARISA, THANK YOU SO MUCH FOR BEING HERE. I'M GOING TO ASSUME WE'RE GOING TO DO SOMETHING WITH BRIGHT COLORS WHEN YOU'RE HERE. >> DEFINITELY. WE'RE GONNA DO SOMETHING REALLY FUN, EASY, WITH SCISSORS AND T-SHIRTS. >> OKAY. >> AND WE'RE GONNA MAKE THIS FABULOUS ACCESSORY. >> OH, SO THIS IS MADE FROM T-SHIRTS. >> IT'S ALL MADE OF T-SHIRTS. IT'S A REALLY FUN CUTTING TECHNIQUE, AND THIS IS LIKE A SCARF. YOU CAN THROW IT ON, BUT IT ALSO HAS AN ELEMENT OF CUSTOMIZABLE FUNCTION, WHERE YOU CAN UNPIN THESE. >> YOU COULD TAKE THOSE OFF AND WEAR THEM SEPARATELY, COULDN'T YOU? >> SEPARATELY, OR YOU COULD REARRANGE THEM. YOU COULD ADD MORE, TAKE THEM APART. >> CUTE. CUTE. OKAY. >> LOTS OF OPTIONS. >> YEAH. AND THE FABRIC IS WHAT MAKES IT TWIRL. >> YEAH, THIS JERSEY FABRIC WHEN YOU PULL ON IT, IT TWIRLS, AND YOU'RE NOT GONNA BELIEVE HOW EASY THIS IS TO DO. >> OKAY. WELL, I'M ANXIOUS TO SEE, BUT AS YOU MENTIONED, WE USE SCISSORS, AND IT'S IMPORTANT TO USE THE RIGHT TOOLS, WHETHER WE'RE CRAFTING, SEWING, MAKING CARDS OR WHATEVER, AND YOU REALLY DO BELIEVE THAT. >> OH, YEAH, I BELIEVE IN USING THE BEST TOOLS, AND THESE MAKE ALL THE DIFFERENCE. AND THE DIFFERENT DESIGNS OF THESE SCISSORS REALLY HELP YOU PERFORM DIFFERENT CRAFT TECHNIQUES, AND I'M EXCITED TO SHOW YOU THIS FUN PROJECT. >> OKAY, LET'S GO. >> SO, I LIKE TO START OFF WITH 4 DIFFERENT SIZE T-SHIRTS. IT JUST MAKES IT EASIER. SEE HOW THESE KIND OF LAYER LIKE THIS? SO, LIKE, THE WORK'S ALREADY DONE. THEN YOU DON'T HAVE TO DO MEASURING. I DON'T WANT TO MEASURE, I DON'T WANT TO SEW. I WANT TO MAKE THINGS REALLY, REALLY EASY. >> FUN, UH-HUH. >> YEAH, EASY AND FUN. AND I'VE GOT MY FAVORITE SCISSORS, WHICH ARE MY EXTREME EDGE SCISSORS WITH THE ADJUSTABLE TENSION. >> IT'S FLAT ALONG THE BOTTOM, SO YOU CAN GET RIGHT ALONG THE TABLE, CAN'T YOU? UH-HUH. >> ...STROKES JUST LIKE THAT. AND YOU WANT TO... >> WHAT'S THAT? >> ...ADJUST THE TENSION WITH THIS LITTLE KEY. SO YOU CAN LOOSEN THEM UP TO HACK THROUGH MANY LAYERS. >> AND THAT COMES WITH THE SCISSORS WHEN YOU-- >> YEAH, IT COMES WITH IT, AND IT MAKES FOR A REALLY FUN LITTLE GADGET, AND IT REALLY DOES COME IN HANDY. WHEN YOU'RE CUTTING DIFFERENT MATERIALS, YOU WANT TO ADJUST THE TENSION, AND IT'S GREAT. >> OR IF YOU'RE WORKING ON PAPER, OF COURSE, THEN THAT'S VERY THIN. >> YEAH, THESE ARE TITANIUM BONDED. YOU CAN USE THEM ON PAPER, FABRIC. YOU DON'T HAVE TO SWITCH BETWEEN YOUR FABRIC SCISSORS AND YOUR PAPER SCISSORS. THOSE ARE THE OLD DAYS. >> THOSE ARE THE OLD DAYS, OKAY. >> THIS IS THE FUTURE OF SCISSORS. SO, ALL I'M GONNA DO IS CUT THROUGH SEVERAL LAYERS AT ONCE, AND-- >> SO YOU TAKE YOUR T-SHIRTS AND BASICALLY YOU LINE THEM UP ALONG THE BOTTOM, NOT ON THE NECK. >> YEAH, I LIKE TO SAVE. I'M A SAVER, AND I LIKE TO BE THRIFTY, SO EVEN THOUGH THESE ARE T-SHIRTS THAT I BOUGHT, YOU COULD ALSO USE RECYCLED T-SHIRTS. >> SURE. >> TIE-DYE T-SHIRTS. AND I'M JUST GONNA CUT-- >> OR ONES THAT HAVE SPOTS IN CERTAIN PLACES, AS LONG AS THE SPOTS AREN'T DOWN THERE. >> YEAH. [LAUGHS] YEAH, CUT AWAY FROM THE STAIN. >> UH-HUH. GOSH, AND YOU'RE GOING THROUGH-- REALLY, IT'S 8 LAYERS. >> UH, YEAH, 8 LAYERS. I ALMOST LOST COUNT OF HOW MANY LAYERS IT IS. >> MM-HMM. >> AND SO I WOULD PROBABLY ACTUALLY TIGHTEN THEM UP. THAT JUST, YOU KNOW, SHOWS YOU CAN GET THE PERFECT TENSION. 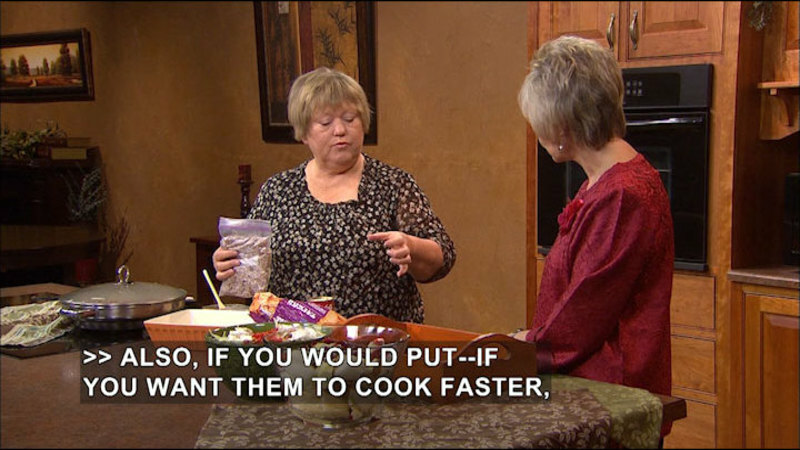 I'LL TIGHTEN THEM UP, AND THEN I WON'T HAVE THAT PROBLEM. I'M JUST SO EXCITED TO SHOW THIS TO YOU. >> YEAH. AND CUTTING ALL 4 AT ONCE, LIKE YOU SAY, YOU GET ALL THE CUTTING PART. THAT'S ALWAYS BEEN MY LEAST FAVORITE IN SEWING IS THE CUTTING OUT. THEN I LOVE THE SEWING. >> YEAH. NOW YOU'RE GONNA LOVE TO CUT. IT'S FUN. 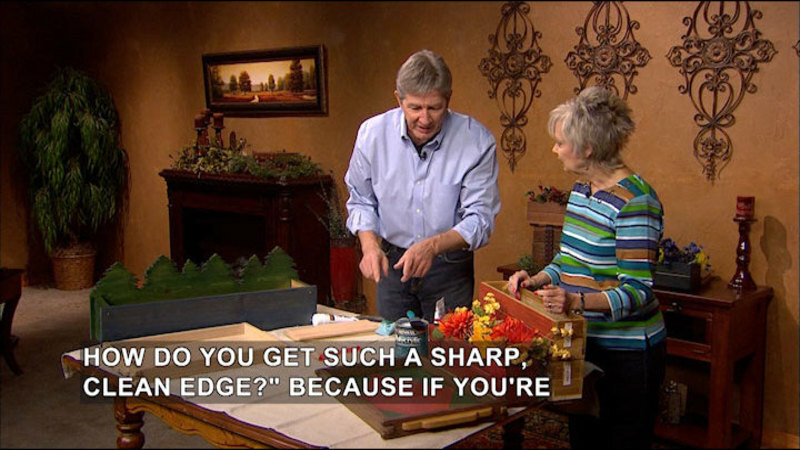 SO, I JUST CUT OFF THAT PART, AND SO NOW I JUST--BECAUSE NOW I WANT TO GET THAT RAW EDGE, BECAUSE THAT'S WHERE THE REALLY FUN ROLLING COMES IN. SO THEN YOU'RE GONNA CUT ANOTHER LENGTH DOWN, AND IT'S ABOUT 3 OR 4 INCHES. >> MM-HMM. >> AND YOU WOULD CUT ALL THE WAY ACROSS. IT'S KIND OF A LONG PIECE. >> WHEN YOU WERE MENTIONING THAT THAT'S THE OLD WAY, THAT WAS ONE THING I LEARNED, GROWING UP. MY MOTHER ALWAYS THREATENED ALL THE KIDS THAT "DON'T EVER TOUCH MY SEWING SCISSORS. YOU CAN USE A DIFFERENT PAIR FOR CUTTING OR WHATEVER YOU'RE MAKING OUT OF PAPER." WELL, IT'S NICE. I'VE RAISED MY CHILDREN SCREAMING THAT AT THEM, TOO, SO I GUESS I DIDN'T NEED TO NOW. >> SHE WOULD HIDE THEM, OR MAYBE SHE WOULD HAVE NEEDED ONE OF MY HOLSTERS TO KEEP THEM AWAY FROM YOU KIDS. >> HEY, THAT'S RIGHT. YOU KNOW, I'M SURPRISED YOU DIDN'T HAVE YOUR HOLSTER ON. >> YEAH. >> THOSE ARE HANDY, BECAUSE I HAVE ONE THAT YOU GAVE ME BEFORE IN MY CRAFT ROOM, BECAUSE I HAVE SO MUCH STUFF OUT THAT I LAY MY SCISSORS DOWN AND LOSE THEM. >> YEAH, THEY'RE GREAT. >> SO IF I CAN PUT IT IN MY HOLSTER, I'VE GOT THEM WITH ME. >> HOLSTERS ARE PERFECT FOR KEEPING TRACK OF YOUR SCISSORS, AND I DESIGN THEM IN A BUNCH OF DIFFERENT PATTERNS. >> I LIKE IT, UH-HUH. >> CUSTOMIZE TO SUIT YOUR STYLE. SO, BACK TO THIS. SO NOW I'VE GOT THIS PIECE CUT OUT, AND IT'S--YOU'RE JUST GONNA TAKE--YOU COULD DO SEVERAL AT ONCE. THESE ARE GREAT FOR CUTTING THROUGH SEVERAL LAYERS, BUT BASICALLY WHAT YOU'D DO IS YOU WANT TO FOLD. FOLD YOUR PIECE OVER. >> MM-HMM. >> AND THESE ARE THE TITANIUM-BONDED MICROTIP SCISSORS, 6-INCH MICROTIP. AND THEY GIVE YOU A LOT OF CONTROL DUE TO THE DESIGN OF THEM. THEY HAVE EXTRA-LARGE HANDLES, AND THEY CUT RIGHT THROUGH THESE LITTLE... >> SO, YOU'RE BASICALLY CUTTING... >> ...SNIPS. >> ...THE LENGTH OF THE SCISSORS SO YOU DON'T HAVE TO GO THROUGH AND MARK IT. >> NO MARKING, MEASURING, ALL THAT STUFF. IF YOU WANT, YOU COULD USE PINS AND YOU COULD PIN IT. >> UH-HUH. BUT YOU DON'T NEED TO. >> YEAH. AND YOU JUST CUT THESE LITTLE STRIPS AND-- YEAH, I WENT AHEAD AND DID SOME AHEAD OF TIME, THESE ONES. I PINNED THEM, AND SO I'LL TAKE THE PINS OUT, AND YOU CAN SEE THAT YOU'RE LEFT WITH A PIECE THAT'S-- IT'S BASICALLY KIND OF LIKE A LADDER. IT LOOKS LIKE THIS. BUT THE FUN THING ABOUT THIS IS WHEN YOU PULL IT, YOU GET THIS EFFECT, AND THIS IS THE REALLY FUN THING. >> OH, MY GOSH. I DIDN'T KNOW HOW YOU WERE GONNA MAKE THAT WORK. [LAUGHS] >> SO EASY. I JUST KIND OF CAME UP WITH THAT ONE DAY AND THOUGHT, "OH, WELL, THAT'S COOL. I BET I COULD DO A LOT OF STUFF WITH THAT." SO, WE'VE GOT ALL THESE. YEAH, YOU'D JUST PULL THEM. >> UH-HUH. >> AND YOU WOULD CREATE ALL YOUR LITTLE NECKLACES AND SCARVES LIKE THAT, AND THEN OF COURSE I LIKE TO EMBELLISH, BECAUSE YOU KNOW I LIKE TO EMBELLISH. >> YES, UH-HUH. >> SO, THE WAY YOU WANT TO EMBELLISH, IS YOU CAN MAKE THESE FUN FLOWER PINS. LIKE I SAID, YOU CAN JUST USE THEM INDIVIDUALLY. YOU COULD EVEN ATTACH A BARRETTE TO THIS. >> AND SOME OF THE SCRAPS THAT YOU HAVE LEFT FROM THESE PROJECTS, LIKE ARMS OR WHATEVER. >> YEAH, LIKE YOU COULD HAVE SCRAPS LIKE THIS AND CUT THROUGH MULTIPLE LAYERS, YOU KNOW, USING YOUR SCISSORS. AND THESE ARE GREAT FOR GETTING IN THOSE TIGHT AND TRICKY AREAS. AND ALL YOU WOULD DO IS CHOOSE YOUR FLOWERS OF DIFFERENT SIZES AND LAYER THEM UP, CHOOSING YOUR DIFFERENT COLORS, AND THEN YOU PICK A NICE LITTLE BUTTON LIKE THAT, AND YOU JUST SEW-SEW A LITTLE PIN BACK ON WITH A NEEDLE AND THREAD. >> UH-HUH. OH, YES. SO YOU'RE DOING A LITTLE SEWING. >> YEAH, A LITTLE SEWING, AND YOU KNOW HOW THAT ALL GOES. I KIND OF PRE-SEWED THESE ONES AHEAD OF TIME. AND THEN YOU WOULD JUST... >> PUT 2 OR 3 TOGETHER. >> 2 OR 3, AND THEN THE FUN THING IS YOU CAN PUT LESS OR MORE. YOU CAN WEAR ALL 4 AT ONCE AND THEN JUST TAKE YOUR LITTLE FLOWER PIN, OPEN IT UP. >> AND THAT ALSO HOLDS THEM, ALL 3, TOGETHER... >> HOLDS THEM TOGETHER. >> ...IN THE COLORS THAT YOU MIGHT WANT. >> YEAH, AND YOU HAVE A NICE THING LIKE THIS. >> HOW CUTE. >> AND I EVEN MADE ONE SPECIAL FOR YOU. >> I WAS GONNA SAY, THIS ONE'S KIND OF MY FAVORITE COLORS-- BLACK AND WHITE. >> I LIKE TO CUSTOMIZE MY GIFTS FOR PEOPLE'S STYLE, SO THIS ONE IS INSPIRED BY YOU. >> WE ALL HAVE MAYBE ONE LEFT OF A REALLY BEAUTIFUL BUTTON. THAT'S A GOOD WAY TO USE IT. >> DEFINITELY, YEAH. A BUTTON FALLS OFF SOMEWHERE, YOU CAN RECYCLE IT, UPCYCLE IT. >> UH-HUH. >> MAKE THINGS OUT OF YOUR OLD T-SHIRTS. >> I NEVER WOULD HAVE THOUGHT WHAT YOU WERE DOING WOULD TURN INTO--[LAUGHS]--THE CURLED NECKLACE. WELL, THANK YOU VERY MUCH, MARISA. THIS LOOKS LIKE A FUN PROJECT. >> THANK YOU. >> KIMBALL, IT'S SO NICE TO HAVE YOU HERE. I'M GONNA PICK YOUR BRAIN ON EVERYTHING I'VE ALWAYS WANTED TO KNOW WORKING WITH AN INTERIOR DESIGNER. AND DO PEOPLE COME TO YOU WITH UNUSUAL REQUESTS LIKE, "I HAVE A SMALL ROOM, BUT COULD YOU MAKE IT LOOK TWICE AS BIG?" I CAN DO SOME MIRACLES, BUT I'M NOT A MIRACLE WORKER. >> OH, I SEE. SO, YOU--YOU HAVE TO WORK WITH WHAT PEOPLE HAVE. >> THAT'S RIGHT. >> OKAY, YOU HAVE SOME EXAMPLES THAT YOU'RE GOING TO SHOW, AND IF YOU'LL POINT OUT THINGS THAT MAYBE WOULD HELP US TO RESHAPE A ROOM OR HOW TO LIVE WITH WHAT WE HAVE BUT MAYBE MAKE IT LOOK BETTER. >> ABSOLUTELY. SO, WHEN YOU WANT TO RESHAPE A ROOM SIZE--THIS IS NOT, OBVIOUSLY, DOING MAJOR CONSTRUCTION BUT DESIGN TRICKS TO MAKE IT LOOK LIKE IT'S A LITTLE BIGGER THAN IT IS. SO, WE HAVE 3 CATEGORIES. WANT TO TALK ABOUT COLOR, WHICH YOU CAN USE TO CHANGE A ROOM SIZE. WARM COLORS WILL COME CLOSER TO YOU AND COOL COLORS WILL MOVE AWAY. AND THEN PATTERNS, WHICH YOU CAN USE IN YOUR FLOORING OR YOUR WALLS, AND THEN ALSO REFLECTIVE SURFACES. >> OH, LIKE MIRRORS? >> YES, ABSOLUTELY. >> OH, OKAY. >> REFLECTIVE SURFACES, THINGS, MAYBE GLOSSY FINISHES REFLECT LIGHT AND MAKE THE SPACE FEEL BIGGER. >> OH, OKAY. GOOD TIPS. GOOD TRICKS, OKAY. >> SO, THESE ARE SOME EXAMPLES ILLUSTRATING THAT. >> GOOD. >> SO, HERE I'VE USED THIS DARK BLUE COLOR IN THIS BAY WINDOW TO PUSH THE BAY WINDOW OUT. IT WAS A VERY NARROW BAY WINDOW, SO I WANTED TO MAKE IT FEEL DEEPER. AND THEN ALSO IF YOU NOTICE THE PLANKS ARE RUNNING CROSSWISE, SO THAT HELPS WIDEN THE ROOM. >> UH-HUH. I CAN SEE HOW THAT WOULD DO THAT, UH-HUH. >> YEAH. SO THAT'S A GOOD EXAMPLE HOW THE POWER OF PAINT AND PATTERN. AND THEN HERE WE HAVE ANOTHER BAY WINDOW IN A BEDROOM, AND THE BAY WINDOW YOU NOTICE WE HAVE 2 COLORS. WE HAVE THE DARK CHOCOLATE AND THE BUTTERSCOTCH, AND THE DARK CHOCOLATE FRAMES THE BAY WINDOW, AND THEN I ACTUALLY DID THE BAY WINDOW IN BUTTERSCOTCH, BECAUSE THE WALL CONTINUES INTO THE BAY WINDOW AND MAKES IT FEEL LIKE ONE BIG CONTINUOUS SPACE. >> OH, INSTEAD OF BEING CHOPPY. >> EXACTLY. >> STOP AND START. >> EXACTLY. IF I HAD DONE THE BAY WINDOW AND THAT WHOLE SEATING AREA IN THE DARK CHOCOLATE, IT WOULD HAVE FELT LIKE A ADD-ON TO THE ROOM, AND IT WOULD NOT FEEL NEARLY AS BIG AS IT DOES HERE. >> OH, OKAY. >> AND THEN ANOTHER TRICK IS YOU NOTICE THERE'S THE PICTURE RAIL, THIS MOLDING, THE WHITE LINE, SO IT REALLY ACTS AS A WAY TO GUIDE YOUR EYE OF WHERE IT SHOULD BE LOOKING, AND THAT ELONGATES THE ROOM. AND SO A TRICK YOU CAN DO TO MAKE YOUR CEILING SEEM TALLER OR LOWER IS I PUT THIS MOLDING HERE BECAUSE I FELT THAT THE CEILINGS WERE A LITTLE TOO HIGH FOR THE ROOM... >> OH, TOO HIGH, OKAY. >> ...IN PROPORTION TO HOW WIDE IT WAS, SO BY BRINGING THE MOLDING DOWN, IT DROPS THE CEILING HEIGHT. >> YOUR EYE COMES DOWN. >> ABSOLUTELY. AND ANOTHER TRICK IS IF YOU WANTED YOUR CEILINGS TO ALSO FEEL LOWER IS YOU COULD TAKE THE CEILING COLOR AND PAINT HERE, SO YOU ACTUALLY CREATE A BAND. >> OH, BRING THE CEILING DOWN-- LOOK LIKE IT WAS DOWN LOWER. THAT'S A GOOD IDEA. >> AND YOU CAN DO THE OPPOSITE, WHERE YOU COULD ACTUALLY TAKE THE WALL COLOR AND BRING IT UP INTO THE CEILING ABOUT 12 INCHES SO YOU CREATE A BORDER AROUND THE CEILING, AND THAT WILL ACTUALLY MAKE YOUR WALLS SEEM MUCH HIGHER. SO, LOTS OF LITTLE FUN TRICKS TO DO. >> REALLY? AND THAT'S JUST WITH PAINT. I MEAN, HOW EASY COULD THAT BE? IF YOU KNOW WHAT YOU'RE DOING. [LAUGHS] >> WELL, YOU KNOW WHAT? I ALWAYS SAY PAINT'S THE EASIEST WAY TO MAKE A CHANGE AND IT'S THE SIMPLEST AND LEAST EXPENSIVE. >> LEAST EXPENSIVE, RIGHT. >> SO DEFINITELY EXPERIMENT. >> OKAY. >> HERE'S AN EXAMPLE OF USING REFLECTIVE SURFACE. BY USING THE MIRROR, IT HELPS DOUBLE YOUR SPACE. WHEREVER THE MIRROR COVERS, IT DOUBLES THAT AREA. AND ALSO BY THE LONG RECTANGULAR SHAPE OF THE MIRROR, IT HELPS WIDEN THE DINING ROOM... >> INSTEAD OF IT BEING TURNED VERTICAL. >> I MEAN, I COULD HAVE DONE IT VERTICAL, AND THEN THAT WOULD HAVE MADE IT FEEL HIGHER, BUT IT'S A LOWERED CEILING WHERE IT'S ONLY A LITTLE AREA THAT THE DINING TABLE CAN FIT UNDER, SO I WANTED TO MAKE IT FEEL LIKE IT WAS A LITTLE MORE BIGGER AND GRACIOUS. >> AND I THINK WE'VE ALL KNOWN ABOUT RESTAURANTS--WE'LL WALK INTO A ROOM AND IT JUST SEEMS SO HUGE, BUT IT'S REALLY ONE WALL'S ALL MIRROR. >> YES, THAT'S RIGHT. >> SO YOU REALIZE HOW THAT CAN MAKE IT SEEM TWICE AS BIG. >> OR DANCE STUDIOS OR YOGA STUDIOS. IT FEELS LIKE THIS HUGE SPACIOUS ROOM, AND IT'S, YOU KNOW-- >> IT'S REALLY TINY. [LAUGHS] >> THAT'S RIGHT. >> THAT'S A GOOD IDEA, THOUGH. >> SO YOU DEFINITELY CAN USE THAT. >> REFLECTIVE SURFACES. >> RIGHT. BUT DON'T GO CRAZY. DON'T DO YOUR WHOLE HOUSE IN MIRRORS. >> RIGHT. [LAUGHS] >> SO, HERE'S AN EXAMPLE OF A HALLWAY WHERE THE BASEBOARD TRIM HAS BEEN PAINTED THE SAME COLOR AS THE WALL, SO INSTEAD OF-- >> OH, I DIDN'T REALIZE THAT WAS THE BASEBOARD. NOW... >> SO THERE'S A GOOD 6-INCH BASE RIGHT THERE. SO, THE HALLWAY IS VERY SHORT AND NARROW, AND BY USING THE SAME COLOR ALL THE WAY UP, IT UNIFIES THE WALL. >> BECAUSE YOU WOULD HAVE A BROWN OR WHITE OR SOMETHING ALONG THERE, AND THAT WOULD BE-- THAT WOULD CHOP THAT UP. >> IT'S VERY CONTRAST-Y. IT'S THE SAME TECHNIQUE, I LIKE TO SAY, WITH FASHION. SO, IF YOU WEAR ALL BLACK, YOU'RE GONNA LOOK REALLY THIN AND IT'S ALL THE SAME COLOR. IF YOU WEAR PURPLE PANTS, AN ORANGE TOP, A GREEN HAT, BESIDES QUESTIONING MY FASHION SENSE... >> YOUR SENILITY. >> ...IT ALSO CHOPS YOU UP, SO IT'S THE SAME IDEA. >> GOOD POINT. >> YEAH. AND THEN THERE'S ALSO DOORS IN THIS HALLWAY THAT I ALSO PAINTED ALL THE SAME COLOR, SO THEY'RE ALL-- THE TRIM IS BLUE, THE DOORS ARE BLUE, AND THEN IT JUST BLENDS AWAY. >> AND THE WHITE, THEN, IS SORT OF SHOWCASED... >> YES. >> ...AS AN ACCENT. >> ABSOLUTELY. AND IN A VERY SMALL BATHROOM, WHICH IS A VERY COMMON PROBLEM IN ANY URBAN AREA... >> YEAH, VERY SMALL, USUALLY. >> IT'S VERY SMALL. THIS IS A SHOWER, EVERY-- THERE'S NO TUB. THERE WASN'T ROOM FOR A TUB, BUT ON THE FLOORING, IF YOU USE LARGE-FORMAT TILES AND YOU ANGLE THEM, IT'LL ACTUALLY MAKE THE SPACE SEEM BIGGER. SO, IF YOU RUN PLANKS FRONT TO BACK, IT'S GONNA MAKE YOUR ROOM SEEM LONGER. IF YOU RUN THEM SIDE TO SIDE, IT'S GONNA MAKE IT SEEM WIDER. AND THEN IF YOU RUN IT ON THE DIAGONAL, IT WIDENS AND LENGTHENS THE ROOM. >> I'VE SEEN PLACES WHERE THEY WERE AT A DIAGONAL, BUT IT WAS USUALLY A LARGE ENTRY OR SOMETHING. I WOULDN'T HAVE THOUGHT ABOUT USING A BIG DESIGN IN A BATHROOM. >> AND THAT IS A MISNOMER, WHERE PEOPLE THINK, "OH, IT'S A SMALL BATHROOM. I HAVE TO USE SMALL TILES." BUT IT'S A THING WITH ALL THOSE GROUT LINES, EVERY TIME YOU SEE A GROUT LINE, THAT'S YOUR EYE--STOP, STOP, STOP, STOP. AND IF YOU JUST SEE MUCH BIGGER TILES AND MAYBE THERE'S ONLY 6 OR 8 OF THEM, YOUR EYE JUST FLOWS ACROSS THE FLOOR. >> I GUESS SO. >> SEEMS MORE SPACIOUS. AND SAME THING WITH THE GLASS SHOWER. INSTEAD OF HAVING A CORNER SHOWER JUTTING OUT, YOU CHOP IT SO IT'S ANGLED, AND THAT HELPS KEEP THE FLOW OPEN AS WELL. AND FOR LITTLE, SMALL DINING AREAS, YOU CAN USE CABINETRY FLOOR TO CEILING, AND THAT'S GONNA INCREASE YOUR CEILING HEIGHT. AND THE THING ABOUT THIS IS IT'S ALL MONOCHROMATIC USING THE DARK COLORS OF THE CABINETRY AND USING THE DARK ISLAND, ALL THE COLOR JUST FLOWS AND THE FLOORS ARE DARK, SO ACTUALLY--THIS IS SOMETHING A LOT OF PEOPLE DON'T KNOW IS DARK FLOORS ACTUALLY RECEDE. SO YOUR FLOORS WILL ACTUALLY FEEL MORE SPACIOUS IF YOU DO A DARK COLOR, BECAUSE THE FLOOR IS DROPPING AWAY. >> AND I WOULD HAVE THOUGHT MAYBE USING THE BLACK OR A DARK GRAY OR WHATEVER WOULD MAKE IT SEEM SO MUCH SMALLER. >> YEAH. WELL, IT'S ALSO BECAUSE WE HAVE THESE WONDERFUL GLASS WINDOWS THAT LETS IN THE LIGHT. I MEAN, IF YOU HAVE-- >> THAT'S PROBABLY COUNTERS IT, DOESN'T IT? >> YOU DO NEED TO TAKE INTO CONSIDERATION WHAT ELSE IS GOING ON. IF YOU DON'T HAVE ANY WINDOWS IN THE ROOM AND YOU DID EVERYTHING BLACK... >> BE A TOMB. >> THAT PROBABLY WOULDN'T BE ADVISABLE. [LAUGHS] >> OKAY. YEAH, I-I CAN SEE THAT. >> AND THEN THIS LAST-- >> OOH, LOVE THIS. >> OH, THANK YOU. >> LOVE THESE COLORS. >> AND THEN THIS LAST EXAMPLE IS IT'S A VERY CONTEMPORARY SPACE. THERE'S NO MOLDING OR TRIM. IT'S VERY STRAIGHTFORWARD, SO IT'S VERY ARCHITECTURAL AND THERE'S VERY SHARP LINES. SO BY DOING THIS BUILT-IN BANQUETTE INSTEAD OF DOING A RIGHT-- >> OH, IT SOFTENS IT, DOESN'T IT? THAT'S WHY I LIKE THAT. >> YOU'RE HIRED. >> I'M HIRED. GOOD. >> THAT'S RIGHT. SO, INSTEAD OF HAVING A SHARP RIGHT ANGLE, BY CREATING THIS CURVE, IT JUST SOFTENS THE FLOW. >> IT DOES. >> MM-HMM. AND THEN THE OTHER TRICK IS IF YOU NOTICE OUTSIDE THE WINDOW, THERE'S ALL THIS GREENERY. >> YES. >> IF YOU BRING IN A COLOR FROM OUTSIDE THAT'S VISIBLE FROM YOUR ROOM AND USE IT AS A MAJOR COLOR AS HERE-- SO WE HAVE ALL THE GREENERY, AND I USED-- >> SO IT JUST EXTENDS THE ROOM INDOORS/OUTDOORS. THAT'S A GREAT IDEA. >> BECAUSE IT FEELS LIKE THE PATIO IS REALLY PART OF YOUR LIVING SPACE. >> NOW, ONE OTHER QUESTION. WHAT ABOUT LIGHTING? IS IT TRUE THAT IF IT'S A SMALLER SPACE, YOU NEED MORE LIGHTING, OR WHAT'S THE SECRET THERE? >> THAT'S A GREAT QUESTION. SO, WHEN I SAID THE CABINETRY IF YOU GO ALL THE WAY UP TO THE CEILING IT MAKES IT SEEM TALLER--IF YOU DROP THE CABINETRY FROM GOING ALL THE WAY TO THE TOP, IT WILL MAKE YOUR CEILING SEEM SHORTER, BUT IF YOU PUT RECESSED LIGHTING ON TOP AND LIGHT UP THE CEILING, THAT LIFTS UP THE CEILING. >> I CAN SEE HOW IT WOULD DO THAT. >> SO, UPLIGHTING IS REALLY IMPORTANT IF YOU WANT TO INCREASE THE HEIGHT OF YOUR CEILING. >> AND IT SEEMS LIKE MORE AND MORE OF THE NEWER HOUSES THAT I'VE BEEN IN HAVE THAT-- IS IT CALLED COVE LIGHTING OR-- >> YES. >> SOMETHING. AND IT DOES. IT JUST LOOKS LIKE IT GOES ON FOREVER. >> YES, EXACTLY. >> AND SOME OF THE ROOMS AREN'T ALL THAT BIG. >> COVE UPLIGHTING IS AN EXCELLENT WAY TO INCREASE THE SPACE IN YOUR ROOM. >> WELL, THESE ARE GREAT EXAMPLES. I CAN SEE HOW PEOPLE WOULD WANT TO APPLY THESE IF THEY HAD A SMALL SPACE, ESPECIALLY, AND MAKE IT SEEM LARGER. THANK YOU VERY MUCH, KIMBALL. >> THANK YOU SO MUCH, SHERYL. IT WAS GREAT TO BE HERE. >> THANK YOU. I HOPE YOU ENJOYED THE SHOW TODAY. 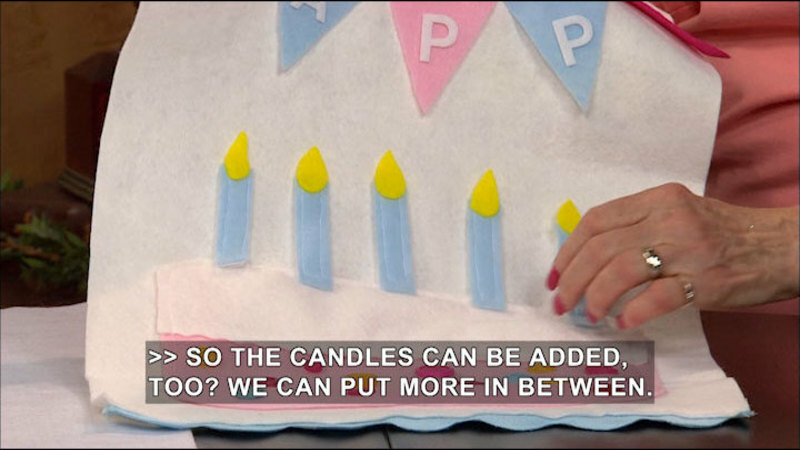 NEXT TIME ON "CREATIVE LIVING," WE'LL LEARN HOW TO OPTIMIZE OUR NUTRITION TO GET THE MOST OUT OF WHAT WE EAT AND WE'LL DEMONSTRATE SOME EASY APPLIQUE TECHNIQUES TO USE ON DOLL FURNISHINGS. ONE OF MY NEXT GUESTS IS A SPIRITUAL MASTER, AND HE'S GOING TO TALK ABOUT OPTIMIZING NUTRITION. HE STRESSES THAT MODERATION AND TEMPERANCE ARE MUCH MORE SUCCESSFUL THAN AN OBSESSIVE- COMPULSIVE DIETS. AND WE'LL MEET A DESIGNER WHO SAYS YOU'RE NEVER TOO OLD TO PLAY WITH DOLLS. SHE'S DESIGNED A LINE OF DOLL FURNITURE AND ACCESSORIES AND WE'LL SHOW HOW TO EMBELLISH THESE ITEMS WITH EASY APPLIQUE TECHNIQUES. I THINK YOU'LL REALLY ENJOY SEEING THE FURNITURE SHE'S CREATED WITH PVC PIPE, SOME PIPE INSULATION, AND A FEW OTHER ODDS AND ENDS YOU PROBABLY ALREADY HAVE AROUND THE HOUSE. BOTH OF THESE TOPICS WILL BE FEATURED ON THE NEXT "CREATIVE LIVING" SHOW. IF YOU EVER HAVE COMMENTS OR SUGGESTIONS OR IDEAS FOR SHOWS, YOU CAN E-MAIL ME AT SHERYL.BORDEN@ENMU.EDU. I'D ALSO LIKE TO ASK YOU TO BECOME A FAN OF "CREATIVE LIVING" ON FACEBOOK. JUST GO TO FACEBOOK.COM AND IN THE SEARCH WINDOW, TYPE IN "CREATIVE LIVING WITH SHERYL BORDEN." I HOPE YOU'LL PLAN TO JOIN ME NEXT TIME FOR "CREATIVE LIVING." >> WE ARE VERY PLEASED TO OFFER A NEW BOOKLET THAT ACCOMPANIES THIS SERIES OF "CREATIVE LIVING." THIS BOOKLET IS TITLED "THE 6700 SERIES," AND IT FEATURES A WONDERFUL COLLECTION OF IDEAS AND INFORMATION, AND IT'S AVAILABLE FREE OF CHARGE ON OUR WEBSITE. POSTED AS A PDF FILE, YOU CAN SIMPLY DOWNLOAD THE ENTIRE BOOKLET OR JUST THE SEGMENTS YOU'RE MOST INTERESTED IN. YOU'LL FIND INFORMATION ON FOODS, NUTRITION, CLOTHING, FASHION, HEALTH AND BEAUTY, HOME DECORATING AND MUCH MORE. FOR YOUR COPY OF THIS NEW BOOKLET, GO TO OUR WEBSITE AT KENW.ORG AND THEN CLICK ON CREATIVE LIVING. SCROLL DOWN TO THE BOOKLET SECTION, AND YOU CAN CLICK ON THIS BOOKLET OR ON ANY OF THE OTHER BOOKLETS WE HAVE AVAILABLE ONLINE. JUST GO TO KENW.ORG, CLICK ON CREATIVE LIVING AND DOWNLOAD THE BOOKLET TITLED, "THE 6700 SERIES." WE ALSO INVITE YOU TO SIGN UP FOR OUR FREE E-NEWSLETTER. JUST GO TO KENW.ORG AND CLICK ON THE "SIGN UP NOW" BUTTON AND INPUT YOUR E-MAIL ADDRESS. THAT'S ALL THERE IS TO IT. YOU'LL ENJOY READING AN UP-TO-DATE NEWSLETTER FILLED WITH INTERESTING TOPICS AND INFORMATION. THANK YOU. Interior Designer Kimball Starr offers suggestions on how to reshape room size through simple decorating techniques, and Laura Waterfield discusses the insulation lace machine used for embroidery. Sheryl and guest also make a t-shirt scarf.